John was born in Hall, Indiana on October 14, 1910 – the second son of Joshua and Roxie Wooden. When he was 8, the family moved to a small farm near Centerton, Ind., a town which boasted a population of 86. By then, Joshua and Roxie had two more children. Six years after that, hard times forced the family to leave the farm and move to Martinsville, Ind., population 4,800. Joshua, a one-time farmer, now worked at a sanitarium to support his family. John flourished at Martinsville High School both as a student and an athlete. He became a star basketball player in the state that is arguably the most passionate about the sport. His talent and leadership resulted in three consecutive appearances by Martinsville HS in the state championship games, winning one. Perhaps his greatest victory in high school was meeting Nellie Riley. They fell in love in an instant. John went to Purdue University where he continued to display his athleticism and leadership. There, he was a three time All-America – the first person ever to be a consensus selection. More importantly to John, his Boilermaker team won the National Championship in his senior year, 1932. That was the year that he and Nellie finally married. It was also the year that John became athletic director, English teacher and coach at Dayton High School. In his first season as the head basketball coach, the team won six games and lost eleven. Three years later he moved to South Bend (Indiana) Central High School where he coached all sports until he enlisted in the U.S. Navy. A ruptured appendix kept John from being deployed to the U.S.S. Franklin per his orders. In a tragic twist of fate, his replacement was killed shortly thereafter when a kamikaze pilot crashed into the ship. After his military service, he returned to coaching high school for one year before being hired as the head coach at Indiana State Teachers College (now Indiana State University). Again, his team performed well, winning the conference championship. The team was invited to play in the National Association of Intercollegiate Tournament. As head coach, John rejected the offer because African-Americans were banned from participating. After a second rejection the next year, that rule was changed, Blacks were allowed to play. With that change, his team entered the tournament. As a result, one of his players became the first ever African-American to play in the competition. In 1948, John and Nellie moved to Los Angeles where he became head coach of UCLA – a perennial also-ran. Under his leadership, things began to change for the program. In his first year, UCLA went 22-7. The next year they won the conference championship. Although his team never had a losing season, post season play didn’t become a reality until 1961-62 season when they lost the semi-final game. The next year they also made the tournament without stellar results. The 1963-64 season, however, was different. That year UCLA made the tournament and went on to beat Duke and win the national championship. They repeated as national champions the following year. UCLA went on to win 10 titles in 11 years – including 8 in a row. In 1975, after the tenth championship, John retired from coaching. Remember that losing season in John’s first year as a basketball coach – the one at Dayton High School? That was his first – and last – losing season in his coaching career. His record as a coach was 664 wins against only 163 losses. He was named Coach of the Century in 1999 by ESPN and Sport Magazine. He was elected to the College Basketball Hall of Fame and was presented with the Presidential Medal of Freedom. No one coach, and no one university, will ever duplicate these accomplishments. As powerful as they are, they do not define a fearless brand. Rather they are the result of the talent and dedication of a fearless brand – Coach John Wooden. Given John Wooden’s record, it’s easy to understand why he is considered to be the greatest coach of any sport in U.S. history – at any level. While that claim might be debatable, what is not in question is Wooden’s leadership, his character and his success. When he retired in 1975, Wooden turned his attention and energy to sharing and teaching his philosophy to winning at sport – and more so – winning at life. He made personal appearances, led basketball clinics and seminars, authored several best-selling books and was at the heart of an award winning Public Broadcasting System special titled John Wooden: Values, Victory and Peace of Mind. Wooden created his Pyramid of Success which features the fifteen essential elements bracketed by faith and patience. (download a printable version here). At his core, Wooden was always a teacher. His rules had a purpose and no one, not even the greatest players he ever coached, were exempt from the repercussions of violating them. Thousands of players learned more than how to play basketball – they learned how to become men – men of principal – men of integrity. His book – Wooden on Leadership: How to Create a Winning Organization, found a huge following in business amongst CEO’s, managers, business owners. His principles were learned beginning as a youngster on a small farm in Indiana and continuing through his years as an athlete and coach. Needless to say, there is a tremendous amount to be learned from Coach Wooden when it comes to building your brand. Strive for success – Wooden defines success this way – “Success is peace of mind which is a direct result of self-satisfaction in knowing you made the effort to become the best you are capable of becoming.” That statement embodies my definition of a fearless brand. To be your best, it is essential to know your purpose and your skills; to define your value proposition and to be relevant. 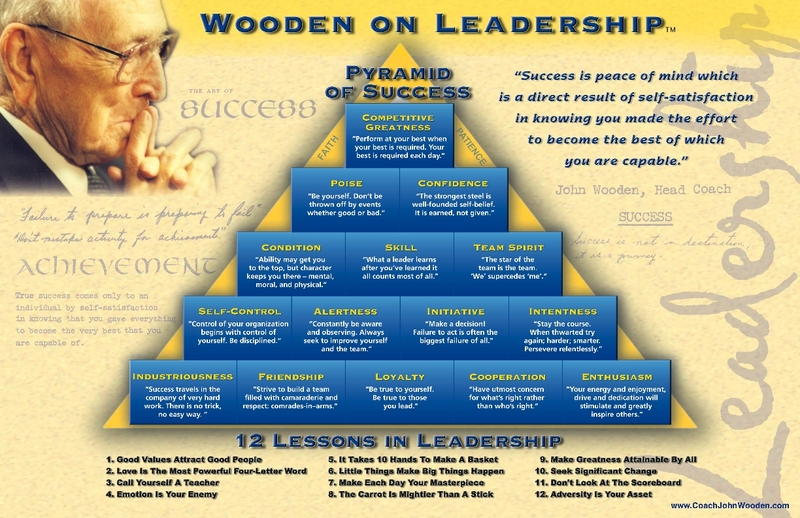 Be disciplined and diligent – Coach Wooden was steadfast in his commitment to principle and integrity. He wouldn’t allow any slacking. It was his dedication to his standards – and insistence that his players do the same – that led to Wooden’s success. There is no substitute for consistency when it comes to branding – and it’s your brand that drives the results which will define your success. Engage a coach! – Wooden got the best from his players – regardless of their talent level. If you don’t have a coach – get one. 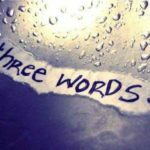 There is no substitute for the independent perspective and insights of a knowledgeable and skilled coach. Everyone will perform better – and achieve more – with the guidance of a skilled and trusted coach. Coach Wooden died on June 4, 2010 – four months shy of his 100th birthday. For a century, he was dedicated to doing what it takes to achieve success. Wooden didn’t set out to be the greatest coach of all-time, nor did he imagine he would win so many championships. However, those are the types of results that come from fearless brands. Emulate Coach Wooden. Find your purpose. Hone your skills. Be dedicated and diligent. Build your fearless brand.